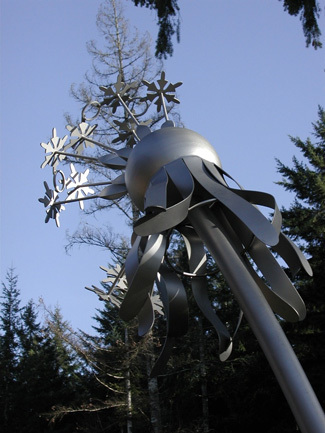 The sculptural environment of five dandelions in varying phases of transformation was originally designed for the Washington Corrections Center in Shelton. The artwork developed during the artist’s first visit to the facility where she saw perfect lawns bordered with flowers planted in military precision. There was not a single weed - unlike her messy garden. She was then directed to design an artwork that could not be climbed on, used as a weapon, or used to hide behind. The artwork represents the artist’s response to the prison environment, representing her impressions of chaos, order, hope and restraint. 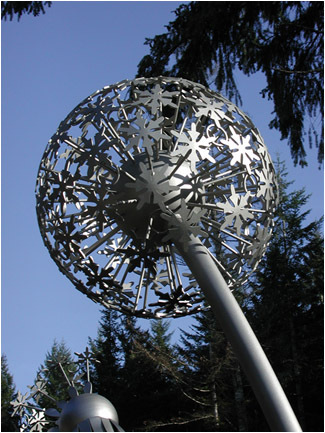 The artwork could not be installed as planned and was installed as the centerpiece of the Olympic College campus where it offers wishes of hope and beauty to students and faculty.